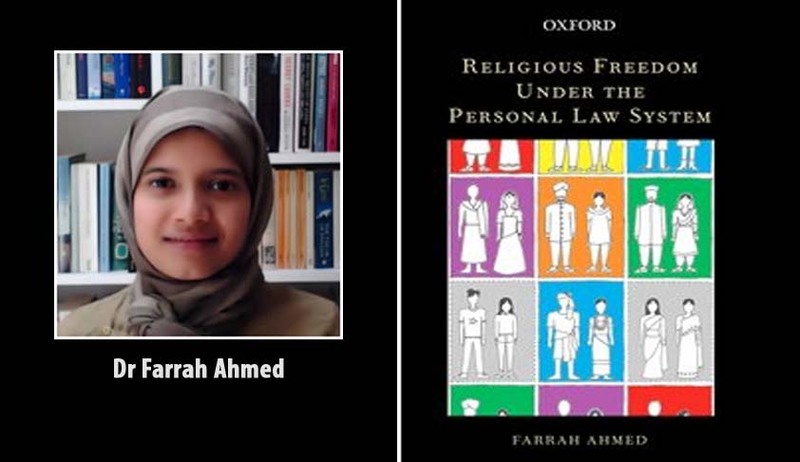 Dr Farrah Ahmed is currently an Associate Professor at Melbourne Law School, University of Melbourne. She serves as Associate Director (India) of the Asian Law Centre, Melbourne Law School. She has also been a Lecturer in Law at the Queen's College, University of Oxford. Her research spans public law, legal theory and family law. She works on personal laws in India, as well as religious alternative dispute resolution in other jurisdictions. Her book Religious Freedom under the Personal Law System was published by Oxford University Press this year. She is currently conducting research on religious dispute resolution processes in Australia as part of an Australian Research Council Discovery grant. Her most recent work on personal laws can be found on her SSRN page. She answered pointed questions from Livelaw through email. Q: There is a criticism that whenever the Supreme Court made observations about the need for UCC, it was not clear on what it wanted. Are the UCC seekers groping in the dark? A: This is an important criticism. It is irresponsible to seek the enactment of the UCC when there is no clarity about the rules it will lay down. To say this is to state the obvious. But the public debate continues to be obsessed with uniformity of family law and unconcerned (at best) about content. Q: Your book suggests that religious autonomy under a UCC would be more restricted than it would be under personal law. Can you explain? A: The central argument of the book is that the personal law system, as it stands, harms religious freedom. Religious freedom, the book argues, requires that we have autonomy over our religious life; that we have self-respect in our religious identities; and that can participate, if we wish, in the practices of our religious communities. The book does not argue that religious freedom would be more restricted under the UCC than it is under the personal law system. It merely cautions (as your previous question suggests) that the impact of the UCC on religious freedom depends on the content – the rules – that it codifies. If, in the name of uniformity, a UCC imposes the norms of the majority on all minorities, this would clearly not advance religious freedom. Such a UCC would impede the religious practice of minorities, and make it difficult or impossible for them to organise their lives according to their own religious norms. So if we care about religious freedom, we should be cautious about this kind of UCC. Q: In your book, your concerns on UCC appear to be a result of certain fears and apprehensions about its possible impact. Can we oppose UCC on the basis of such fears, as there is no evidence that these fears are valid. A: I do not oppose the UCC in my book. But I do urge caution and careful reflection when it comes to the type of UCC that we enact, and the way that we debate its enactment. The need for caution is evident if we look at the context in which calls for the UCC are made, and if we look at the subtext that accompanies these calls. A number of scholars have expressed concerns that the kind of Uniform Civil Code likely to be enacted would codify Hindu norms to the exclusion of others. Such a UCC would be completely at odds with a pluralistic vision of India where diversity and difference are celebrated. Scholars have also consistently argued that the subtext of much of the public debate surrounding the UCC is that Indian Muslims are barbaric, obscurantist, fundamentalist and enemies of national unity. This subtext should give us pause, to put it mildly. Q: You are against making UCC compulsory or optional. You also have concerns about abolishing personal laws. What is the way out? A: To reiterate, I am not against the UCC, as such. I think we need to take a two-pronged approach to reform. First, since the UCC raises well-founded concerns, we need to think carefully about the enactment of statutory family laws which are sensitive to these concerns, and genuinely in the interest of vulnerable members of families. Second, in a recent work I argue that one way to address the concerns about the enactment of a UCC is to supplement it with a well-regulated state-recognised regime of religious alternative dispute resolution. By religious alternative dispute resolution (or ADR) I mean arbitration, mediation or conciliation conducted according to religious norms, agreed to by parties in a contract. The establishment of the All India Muslim Women’s Personal Law Board, sharia courts and ‘jamaats’ run by women across the country, and the involvement of Muslim women’s NGOs such as Bharatiya Muslim Mahila Aandolan and Awaaz-e-Niswan in developing gender-just interpretations of religion for religious ADR are promising signs. The emergence of these new religious ADR providers opens up a ‘competition’ between different visions of religious doctrine offered by patriarchal and gender-just organisations. State recognition for religious ADR could come with built-in safeguards. For instance, recognition could be conditional on threshold requirements of justice, fairness and consent. Beyond these safeguards, the state could also accredit or license religious ADR organisations like the Bharatiya Muslim Mahila Aandolan which operate on gender-just principles, so that the outcomes of their processes are readily recognised and enforced by courts. Equally the state could refuse to accredit or license religious ADR organisations which do not operate on gender-just principles. The state could also offer free or subsidised professional development courses to religious ADR organisations on the threshold requirements for enforcement by courts. I offer more detail in my forthcoming work. Q: How are the current challenges before the Indian Supreme Court against the Muslim Personal laws different from the 1997 AWAG Judgment? The fact that the victims of personal laws are now before the Supreme Court - will it make any difference to the outcome of the cases? A: There are several puzzling features of the Shayara Bano challenge that make it difficult to predict the outcome. For instance, the petitioner challenges, among other things, ‘triple talaq’, on the ground that it is unconstitutional. But at least since the 2002 Supreme Court case of Shamim Ara v State of UP, the position in Muslim personal law is that a man can only divorce his wife by formal performative utterance following attempts at reconciliation with arbitrators; and he must show reasonable cause for divorce. This position is echoed in several High Court cases. Flavia Agnes has carefully outlined the many legal avenues for redress open to the petitioner in Shayara Bano which were not pursued. I cannot predict the outcome but, like Agnes, I think it is unfortunate that there is such widespread ignorance of recent developments in Muslim personal law. It seems that the UCC debate is so polarised that facts often give way to a desire to fit particular cases into the dominant narrative of oppressed Muslim women who are victims of ‘barbaric’ Muslim norms. Q: In your book, you draw a distinction between codified personal laws, and uncodified personal laws which are actually customs. If a personal law has to be codified to merit a legal challenge of inconsistency with fundamental rights, how are customs and practices, which are uncodified personal laws, challengeable? Is there a list of personal laws which have been codified? A. I agree that it is strange that custom is challengeable but uncodified personal laws are not. Courts have however, e.g. in the Narasu Appa Mali case, maintained a distinction between custom and uncodified personal law. In my view, this position is neither coherent nor justified. Yes, a number of personal laws are codified: the Hindu Succession Act, Hindu Marriage Act, Muslim Personal Law (Shariat) Application Act, Muslim Women (Protection of Rights on Divorce) Act are some examples. Q: What do you think about the Law Ministry's reference to the Law Commission to submit a report on the UCC? Will it help to bring clarity on the debate? A: Perhaps. I hope that they consult widely and well.